At Showerrods-etc, a division of JSharone's, we bring you only the best quality shower rods available on the market. Since 1981 our focus has been specializing in custom made shower rods according to the client's needs. In that time we have also expanded to other areas of decorative hardware, such as bath & kitchen, cabinet and door hardware. Quality - We have earned the trust of many of the manufacturers in the decorative hardware business as well as contractors and designers, and sell you only the highest quality of products. Selection - We keep current of all the latest in design, and frequently update our websites with each manufacturer's products. Service - We stand behind all our products and customer satisfaction. From helping you find and purchase the best fitting product to choosing the best option available for shipping. Any questions or comments please email us using our contact page or call us. 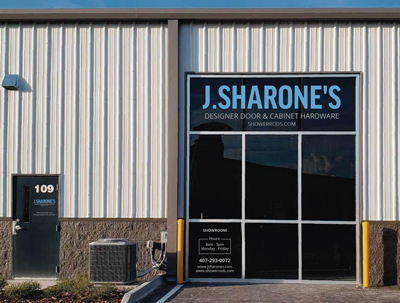 Located in Winter Garden, Florida, we invite you to come to our showroom when possible. From Turnpike get off on exit 267B toward Ocoee. Keep west on Colonial for 1 mile and turn left on Gillard Ave. J.Sharone's is on the left side suite 109.